Europe's net car prices – which include discounts and incentives – fell 3% in the first eight months of the year, compared with an average annual decline of about a 1% in recent years. New-car prices in Europe are tumbling as automakers are forced to offer big discounts to counter a sales slump caused by economic misery and the end of scrapping incentives. The price war is affecting automaker profits, pushing their European operations into the red. Net car prices – which include discounts and incentives – fell 3 percent in the first eight months of the year, compared with an average annual decline of about a 1 percent in recent years, Jean-Marc Gales, director of brands at PSA/Peugeot-Citroen SA, told Automotive News Europe. 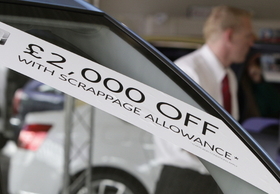 Automakers complain about aggressive discounting, but none admit to doing it. Instead they blame other car companies. Ford Motor Co. Chief Financial Officer Lewis Booth said on an Oct. 26 analysts call that in Europe "some of our competitors are doing very unbusinesslike things at the end of each month." As examples he mentioned flooding dealer lots with unwanted new cars that are self-registered and later sold off at used-car prices. Fiat CEO Sergio Marchionne said some of his company's rival in western Europe "have taken a much more aggressive view of pricing" to offset slow demand for new cars and to keep their factories busy. “We have resisted taking part in what we consider to be value-destroying initiatives in terms of pricing, which is a lot more frequent in Europe than it is anywhere else,” Marchionne said Oct. 21 on a telephone call with financial analysts. Renault's sales chief, Jerome Stoll, said his company is ready to cut prices to keep business. Volkswagen AG sales chief Christian Klingler said the automaker is able to resist pressure to cut prices because it has launched products that are in high demand, such as the VW Golf, Polo, Sharan and forthcoming Passat. "We are in a good position and there is no indication that will change," Klingler said on the company's third-quarter results call with analysts Oct. 27. After European governments ended or phased out cash incentives to encourage buyers to swap old cars for new models, unit sales in the EU declined 4.3 percent to 10.25 million units from January to September, according the European automakers association, ACEA. Falling unit sales and lower prices plunged European operations at Ford, General Motors Co., Fiat and Toyota into the red. Ford reported a $196 million (141 million euros) operating loss in Europe during the third quarter, compared with a $193 million operating profit a year ago. Toyota said its operating loss in the region doubled to 13.6 billion yen (121 million euros) from a 6.8 billion yen decline in the same April-June period the year before. GM Europe, which includes Opel/Vauxhall and European operations of Chevrolet, reported a $200 million operating loss in the April-June period, a figure not directly comparable with past year results which also included global results of Saab Automobile AB. Barclays Capital Research expects Fiat's passenger-car operations in Europe to lose 647 million euros this year, following a 206 million euros operating loss last year. Fiat, like VW, Renault and PSA, does not break out European results from its global numbers. Bernstein analyst Max Warburton said Europe will remain unprofitable for automakers because there were only minimal capacity cuts during the economic crisis and because annual unit sales remain below 13 million. "Essentially, no one is making an operating profit selling cars in Europe, outside of the premium brands," he said.